Building infrastructure and improving accessibility for bike riders can improve inclusion for people with disabilities and their families. Carrying a bike up stairs to access a cycleway, or to connect a rail journey is difficult for some riders, impossible for others and creates a manual handling risk. Stairs are a barrier for people with disabilities that can prevent access to places and services. 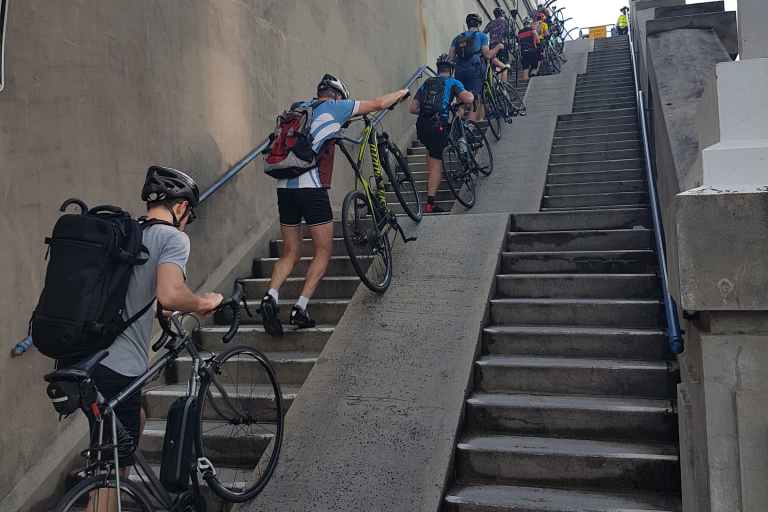 Bicycle NSW has called for more inclusive ramp access to be built to the Sydney Harbour Bridge cycleway, for better bike storage on inter-city and country trains and for the building of rail trails that make rural and regional areas more accessible. Transport for London research found that 78% of people with disabilities are able to cycle and 15% use a bike for some journeys. In Cambridge where cycling accounts for 32% of trips, 26% of the journeys people with disabilities take are by bike. “Building infrastructure that enables more people to cycle and connect their journeys step-free puts more of our state within reach of everyone,” said General Manager of Public Affairs, Bastien Wallace. Over 18% of Australians have a disability and the proportion of the population impacted increases with age. Ensuring full accessibility on new projects like Sydney Metro is crucial, but across NSW people struggle with inaccessible buses and train stations. “It’s great to see some stations get lifts fitted, but we’re calling on Government to ensure NSW is accessible to everyone,” said Bastien.